Disneyland opened its gates in Anaheim, California on July 17, 1955. It was billed as the most high-tech theme park in the world, with a 'wow' factor on par with the World's Fair extravaganzas. 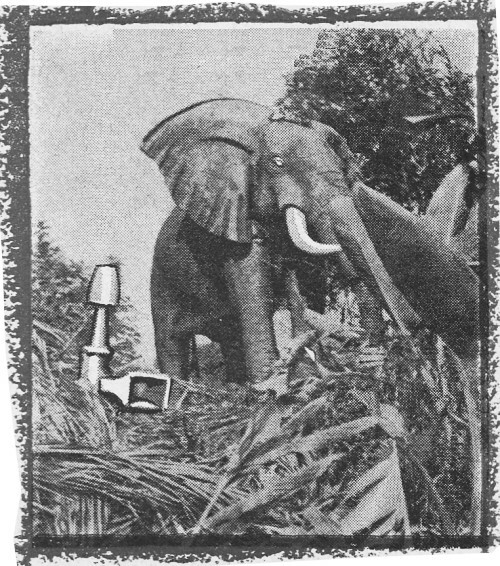 One of its much-ballyhooed features was the 'realistic' jungle safari tour with life-like animal automatons and authentic 3-D jungle sounds. 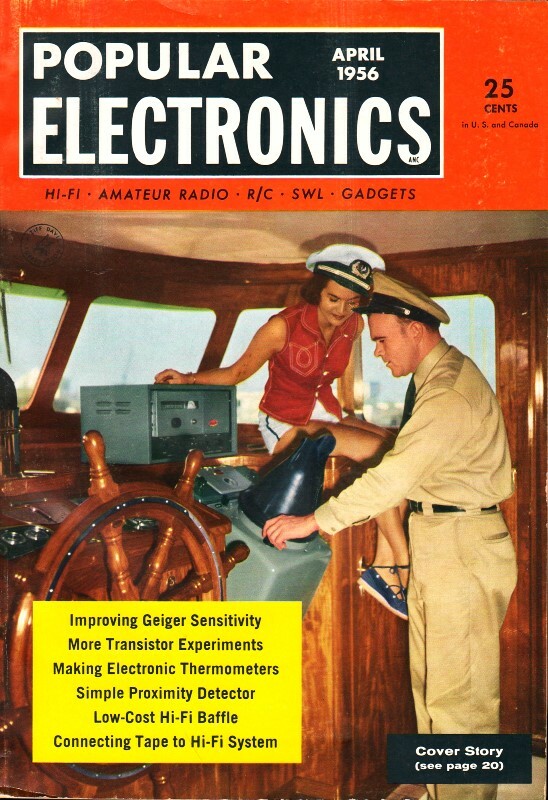 This article, published less than a year after opening day, highlights some of the equipment and methods used by artists and engineers to achieve the effects. Whether you want a rocket trip to the moon or a riverboat ride through the African jungle, you can find it in Disneyland, the super dream-and-play area created by the famous Walt Disney in Anaheim, California. Carousel uses 10 speakers around canopy for musical rides. But more than a land of fun and fantasy, Disneyland has proven to be a vast laboratory and workshop where engineers and technicians have let their imaginations run wild in creating new equipment and startling visual and sound effects. 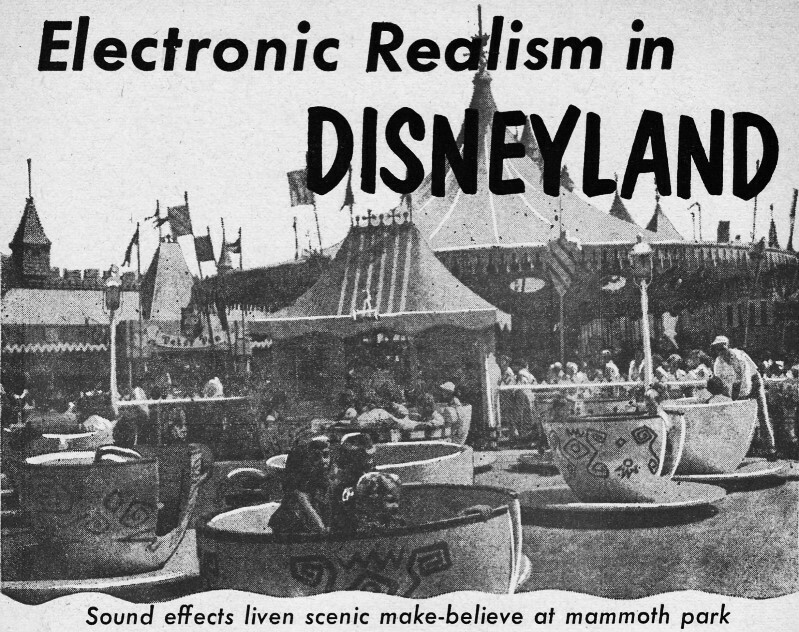 The sky was the limit in setting up Disneyland, and hundreds of specialists from such companies as Altec Lansing, Ralke, Berger Electric, Graybar Electric, etc., combined their talents to create illusions of sight and sound. One hundred and sixty acres of flat, sandy ground were transformed into an intricate terrain of make-believe mountains, valleys, rivers, lakes, and forests. Artists, architects, earth-movers, builders, studio technicians, and electronics men teamed up to change a wasteland into the many little worlds that comprise Disneyland. These include: Adventureland, Fantasyland, Frontierland, and Tomorrowland. 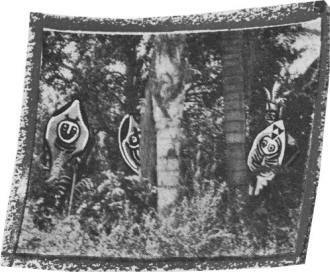 Cruising down jungle river, visitors see and hear warlike savages, drum-beats, wild-animal cries. Close-ups (above & below) reveal behind-the-scenes Altec Lansing speakers, camouflaged to resemble huge mushroom growths in foliage. The sound installation, made by Altec, simulates the noises of dozens of beasts and birds that inhabit the banks of the jungle rivers. Prerecorded tapes are the storehouse of such sounds. 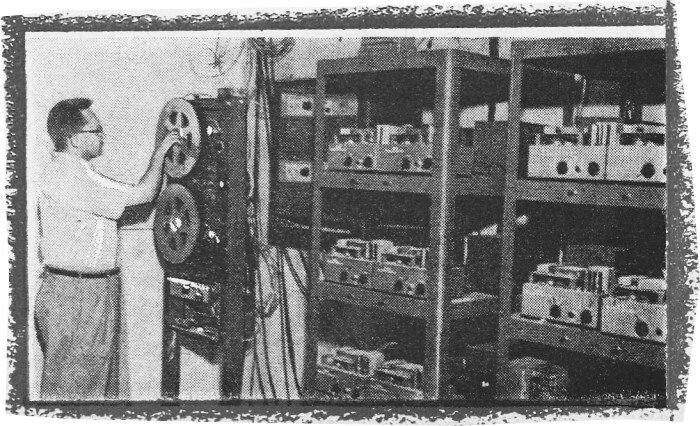 In the Adventureland control room, trumpeting elephants, roaring lions and rhinos, chattering monkeys - as well as the beating of native drums - originate from a bank of tape players. These machines play continuously a tape of any desired sound, repeating it at 10-second intervals. 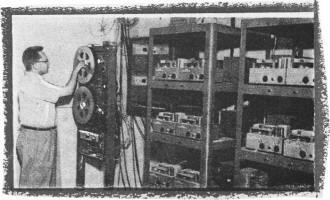 Operating in this manner, the tape machines repeat their messages 4320 times daily. Finding the sounds to go on these tapes was a job in itself. It required months of searching through the sound track morgues of movie studios, broadcast stations, and universities. 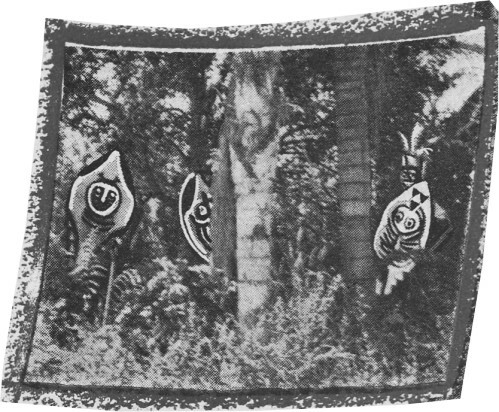 Seventy-four separate loudspeaker systems, each carefully camouflaged beside animals and in the trees, reproduce the sounds. Six miles of cable connect these speakers to power amplifiers. One difficult problem encountered was how to move the sound of birds that were supposed to be flying from one spot to another. Complete realism was required; the system had to do the job without the customary relay clicking and time delay switching. Invented solely for this task was a unique unit dubbed a "rotation audio fader." 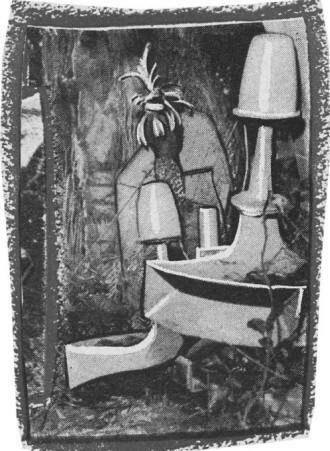 This device transfers the bird calls from one set of speakers to another so neatly that visitors to Adventureland swear they actually see the non-existent birds flying in the dense foliage. 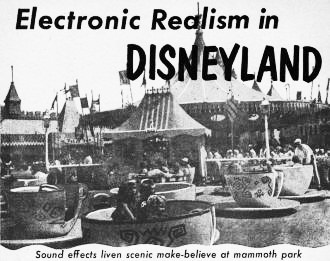 All other sounds in Disneyland blend into their surroundings so well that it is impossible to identify them as being artificially produced. The myriad of voices, music, and background sound is so vital to the operation and success of Disneyland that a full-time sound crew has been hired to stand by constantly to service the equipment. - John A. Norman. Maze of equipment and wiring is electronic heart of Disneyland. Technician Jim Hervey adjusts tape system that is sound source for all audio effects heard throughout 160 acres of play area.